The preferred method to characterize feedstock, intermediate streams and finished hydrocarbon products has been combustion and UV fluorescence because of its sensitivity, linearity, dynamic range and ruggedness. This article deals with the total sulfur content determination in gasoline based on the ASTM D5453 Standard Test Method. As sulfur is a ubiquitous element in hydrocarbon streams and is responsible for a number of undesirable effects such as catalyst poisoning, detrimental product quality and ecosystem pollution, it is important to quantify and monitor its content in every step of the industry’s technical operations. Sample components combust to form CO2 and H2O when hydrocarbon samples are introduced into a pyrotube at 1050°C. Sulfur compounds are present in hydrocarbon mixtures and fossil fuels in a wide variety of forms and chemical nature, however as described in the general reaction equipment, they also form combustion products as described in the general reaction equation (I). The measurement of sulfur may be altered by water in the liquid phase or vapor phase and the combustion product must have the water removed before entering the reaction chamber where SO2 molecules get excited and relaxed as per equations (II) and (III) below. A PMT set at the right wavelength range will determine the emission signal of the sulfur species. Samples were studied in the new Antek MultiTek® analyzer in a vertical configuration with an autosampler and UV Fluorescence detector. In order to validate, the MultiTek performance was compared with results from the ASTM Proficiency testing Program (PTP) on Reformulated Gasolines. Using dibenzothiophene (DBT) in toluene, the MultiTek VNS analyzer was calibrated in a range from 0 to 25mg/kg. The instrument parameters used for RFG analysis and calibration are listed in Table 1. Figure 1 shows the sulfur calibration curve. The resulting correlation coefficient was more than 0.9999. The limit of detection or 3σ was determined using the calibration data. For this application range the data resulted in a LOD of 120ppb sulfur. Figure 2 shows a selected representation of the injection signal distribution. In an attempt to cover the complete concentration range of the samples analyzed, samples were selected. Results obtained for the last eleven ASTM ILS RFG reports are tabulated in Table 2. A correlation between MultiTek results and the reported ILS robust mean for all the samples are plotted in Figure 3. 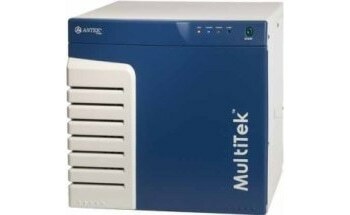 The MultiTek analyzer is a highly stable and consistent instrument. Figure 4 shows the stability test on the MultiTek® system: a 10 ppm sulfur sample exhibits excellent stability to ensure product quality and process monitoring. The results obtained show that the MultiTek® analyzer is a powerful tool for determining sulfur content in order to ensure the final product quality of gasoline based on the exceptional calibration linearity, low limit of detection, excellent repeatability and extremely stable response.